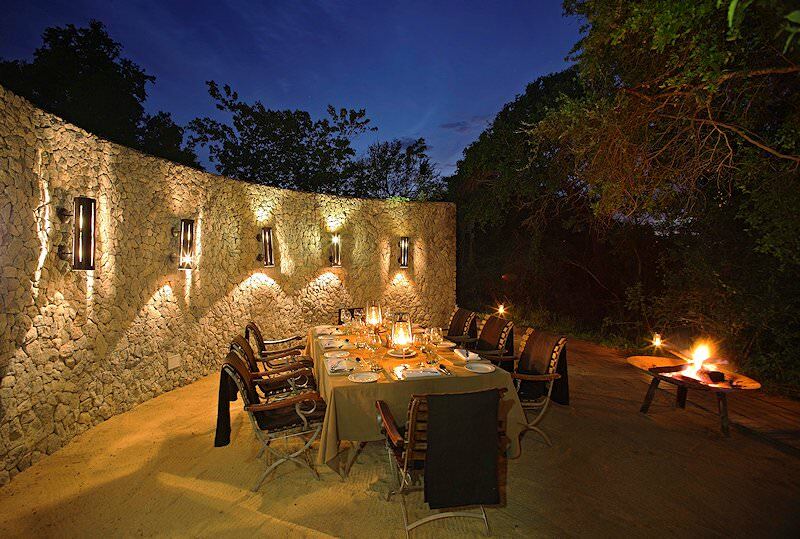 Dulini Leadwood Lodge is one of the most exclusive and intimate properties in the Sabi Sand Private Game Reserve. Dulini Leadwood Lodge is situated in the Sabi Sand Reserve adjacent to the Kruger National Park, with only a wild, unfenced border separating these two conservation areas. The lodge is set in a lush area where the Sabie and Mabrak rivers meet. The untamed wilderness and wildlife at this lodge provide spectacular bushveld tableaus. 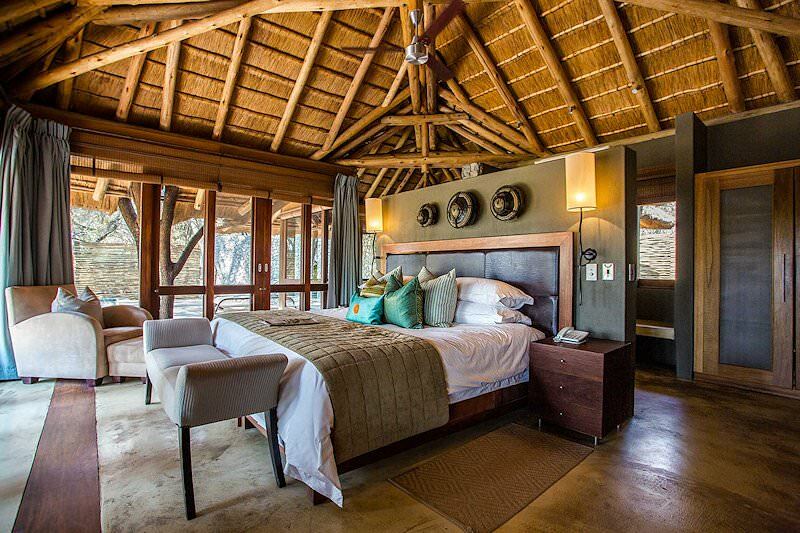 For those looking for intimacy and luxury, Dulini Leadwood Lodge is the perfect destination. The Sabi Sand Private Game Reserve is not only home to the Big Five and a host of other animals, but also lovely landscapes of koppies and rivers. There is a vast array of species to observe on safari in this area of South Africa, including giraffe, zebra, cheetah and even African wild dogs. 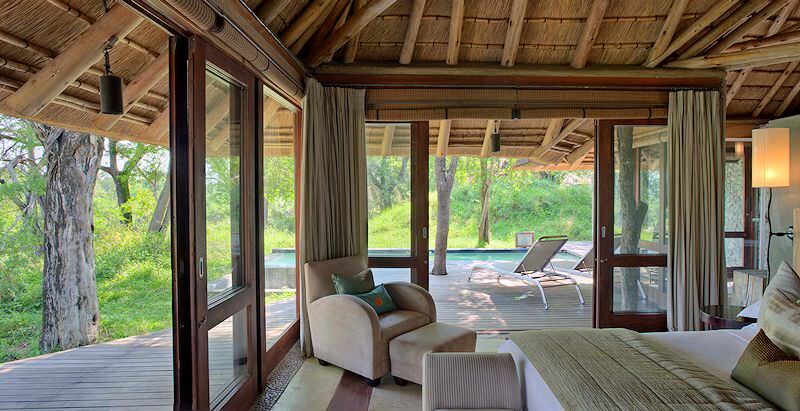 Dulini Leadwood Lodge consists of only four luxury suites, and only three units are booked at a time. 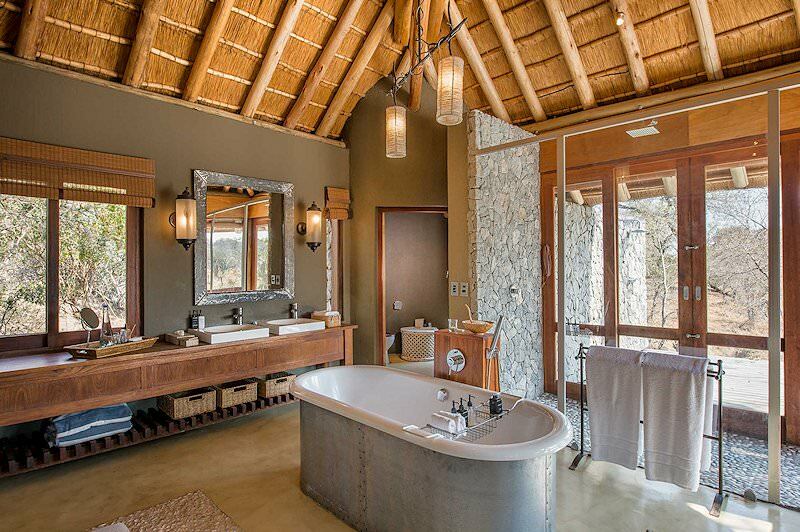 If the whole lodge is booked out for exclusive use, the fourth suite can be made available. The epitome of luxury, the suites feature private infinity edge plunge pools, deep soaking tubs, rainfall showers and cozy fireplaces. Every unit also contains king size beds, a mini bar, air-conditioning and underfloor heating to ensure constant comfort. 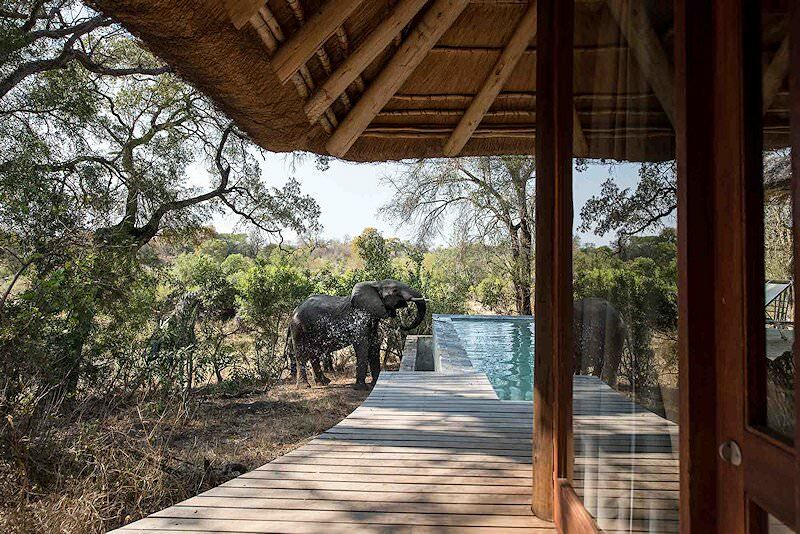 Stunning decks provide magnificent views of the surroundings, and it would not be uncommon to see elephants and giraffes from your own room. The suite decks can also serve as private dining areas, but dinners are best enjoyed around the fire in the open-air boma. Another dining venue is the lodge’s viewing deck surrounded by Jackalberry trees. A fully stocked wine cellar provides South Africa’s best wines to be paired with meals. Guests can even request preferred wines before arrival. Well-versed field guides and local Shangaan trackers provide unforgettable game drives twice a day – in the early morning and then again in the late afternoon, leading into the early evening. These are the times that animals are most active and most likely to be seen. As the pristine Sabi Sand Private Game Reserve is teeming with a spectacular array of creatures, a diverse range of sightings will entertain not only first-time safari guests, but also wildlife enthusiasts. There is also the option of going on a guided bush walk in between your game drives or relaxing with an in-room spa treatment. 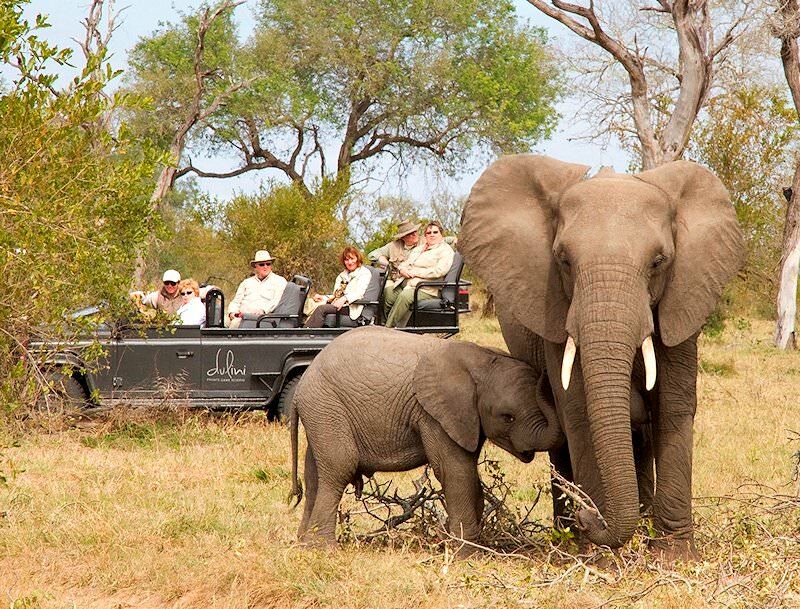 South Africa's safari areas offer something for everyone & cater to a variety of budgets. Botswana's wilderness areas are remarkably pristine and wonderfully remote. Namibia's top safari destinations include Sossusvlei and Etosha National Park. Zimbabwe boasts a spectacular view of the Victoria Falls. Mozambique's 1000km coastline is replete with pearly white beaches & coral reefs. The Kruger National Park is a wild paradise for safari enthusiasts, stretching across almost two million hectares of stunning wilderness. The luxury safaris we offer range from exciting four star safari packages to exclusive top-end itineraries that include top safari lodges. The Big Five - the lion, the leopard, the elephant, the black rhino and the Cape buffalo - offer some of the most rewarding safari encounters. The African lodges we use have been carefully selected for their high service levels, dramatic locations and game viewing potential.